I admit that I'm surprised by my reaction to the unfolding story of the oil spill in the gulf coast. Because of my work, I am confronted with almost daily reminders of the havoc our society wreaks on animals. Difficult, yes, but it's part of my job to seek out these stories. What I don't understand is why I've had to turn off the news every time a report comes on about it. I simply can't bring myself to listen. It was the sense of impending doom, perhaps, that made me unable to listen when the news first broke in the last two weeks. I have a similar reaction when I read, for example, about Lincoln's assassination and find myself hoping that the inevitable can be avoided this time by simply willing it so. However, as I write this on Tuesday, the oil spill has reached the Louisiana coast and is threatening three other states (or, for all I know, already has reached Alabama and Florida) and the doom is real, no longer impending. 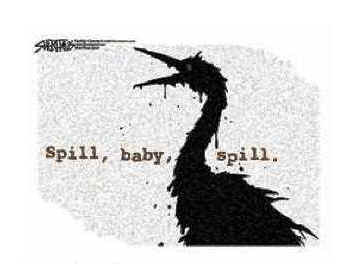 There have been many comparisons to the Exxon Valdez spill in Alaska in March 1989. Perhaps that gives insight into my reaction. 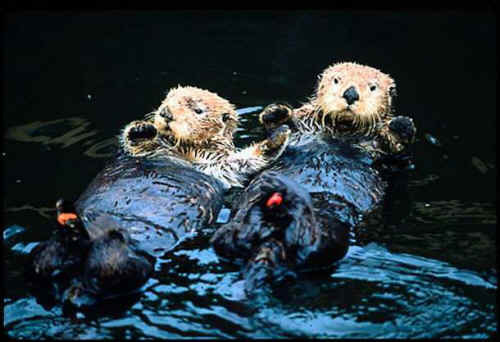 In summer 1989, I decided to join the many volunteers at the Sea Otter Rescue Center in Seward, Alaska. Although I was there for only a week, it was a turning point for me. Before then, my involvement with animals and animal issues was marginal. Oh, I "loved" them and the year before had become a vegetarian because of them. I was beginning to learn about issues involving our treatment of animals. However, I had never taken any steps to help them that took me out of my comfort zone. Then came that evening when an Exxon oil tanker struck Bligh Reef. The ensuing images and the disturbing news coming from Prince William Sound that spring and early summer moved me to take action and so I signed on to volunteer in Seward. I kept a journal of my experiences but have rarely re-read it. However, this recent disaster sent me looking for the journal. Again, I'm not sure why: it doesn't bring comfort (after all, Exxon litigated all the way to the US Supreme Court, after assuring the public in the wake of the spill that it would pay all claims - does that sound familiar? - with the case finally resolved only a few years ago). Nor, obviously, did the 1989 disaster teach us that the risk of ecological disaster outweighs our insatiable desire for petroleum. Nonetheless, it somehow seems appropriate to re-live that week in July 1989, even if the words don't provide me with answers, let alone consolation in facing this new disaster. The Center is built according to blueprints developed prior to 3/24/89 for use at any emergency involving otters. The otters are flown here by helicopter, kept in a holding pen to allow them to relax a bit, then (mildly) sedated, washed (about 45 min. ), rinsed (45 min) and dried. They are put into temporary pens, then after about 7 days, into a pool. Interestingly (and sadly) enough, they haven't yet been released back into the water as they have a strong homing instinct and would return to the fouled waters. They are being kept near Homer, in the sound but still not totally free, until their fates are decided. It was sobering; at the beginning, I almost felt like crying. It's so unfair to these poor scared otters. Ours is #161. She's a female about 3 yrs old. She arrived yesterday afternoon. The vet had sedated her with valium & she was given another dosage in the middle of the process. First, the tag is put on - it can't feel good - using a leather hole puncher into the flipper. There are 3 volunteers on either side and a staff member at her head. When I get in the room, she's already sedated although not completely unconscious. She's lying on her back on some (soft) blue plastic netting-non rigid-suspended over a tub. There are 4 shower nozzles, one for each of us. First we rinse her with luke warm water, then the soap is applied to her. We rub it in vigorously and it soaps up surprisingly. Her fur is so dense and soft--unlike anything I've ever felt. After a good rinse--it's dangerous to leave any soap on her coat-- we toweled her dry and carried her to the drying room. This part seemed endless as up to 4 noisy high-powered hand held dryers were trained on her. It took probably a good hour to completely dry her. She then was put in a wooden carrying case in a special room with shaved ice. She was given an ‘antagonist' for the valium and almost immediately came out of sedation. She appeared drunk and disoriented but seemed to like the ice. Maybe 30-45 min later the vet took her back to a tote. I have no idea whether #161 was part of the 35-45% of the oiled otters who survived, let alone whether she made her way back to freedom. I still remember the feel of her fur. I can only wonder what our memories of the current disaster will be in twenty years.